Finally all the various screwdrivers are in one place with Tool Sorter Screwdriver Organizer. This Tool Sorter Screwdriver Organizer offers plenty of space for long, short, stubby, or off-set screwdrivers. Or just store whatever has a shaft and handle and fits as shown in the picture. The maximum length of tools to be stored is 10.5”. The low profile tray with dimensions of 13” x 10” x 1” can be used in shallow tool drawers and provides space for up to 16 screwdrivers and 8 bits. This Tool Sorter Screwdriver Organizer works with all types and brands of screwdrivers. Getting the typical random assortment or a set of screwdrivers stored is not a problem. Little compartments in the Organizer Storage Tray accommodate a range of handle sizes. Small troughs in the compartments limit movement of the tools in the tray. Please note that screwdrivers are not held in place by clips. This Organizer Storage Tray is compact, portable and made of sturdy ABS – you will feel the quality! 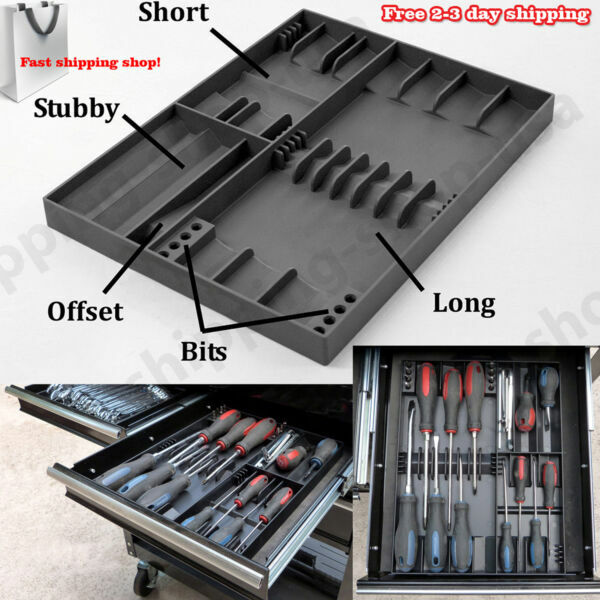 This Organizer Storage Tray is a great addition to tool chests of professionals and serious DIY mechanics, and a very useful thing to have in every home. Tools are not included!